Dr. Milner is currently a neuropsychologist at the Montreal Neurological Institute (MNI) and is known as one of the most important neuroscientists of the twentieth century. She is best known for her work on patient H.M, although she is also well known for her work on establishing how the two hemispheres interact. 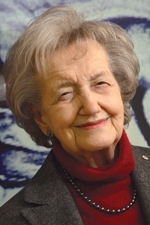 Dr. Milner has received numerous awards and recognition for her work including; induction into the National Academy of Sciences (USA), the Royal Society of London and the Royal Society of Canada, the prestigious international Gairdner Award (2005) and was promoted to a Companion of the Order of Canada in 2004.